Yes, charter schools are tuition-free, public schools that operate independently from the school district’s central bureaucracy. Each charter school is governed by its own local school community, which often includes parents and teachers – rather than a district. This freedom allows teachers to be more innovative and communities to shape their local school. How can I apply to a charter school? Are there admission requirements? By law, charter schools can never have selective admissions; anyone can apply and if more students want to attend than there are seats available, there is a lottery to determine who is admitted. Charter schools are open to all students who want to attend, regardless of where they live. If the school receives more student requests than it has spots available, it is required by law to hold a blind lottery to determine which students will have the opportunity to attend. Many charter schools have wait lists and may admit more students as spots become available. Why isn’t our local charter school located in a traditional school building? Under state law, school districts are required to provide adequate and equivalent facilities to charter public schools, but districts vary in their compliance with this law. Many charter schools secure their own facilities, using state financing or donations. In some cases, the charter schools may build a full school campus from the ground up; in other areas, they may rent available space in churches, community centers or commercial buildings. If charter schools are independent from the district, how are they held accountable? Charter schools are actually more accountable to parents and students than conventional schools. Because they are governed by the parents, teachers and administrators that make up the local school community, charters are directly accountable to the community they serve. Local governance allows the school community freedom to innovate and make decisions based on the needs of its students. 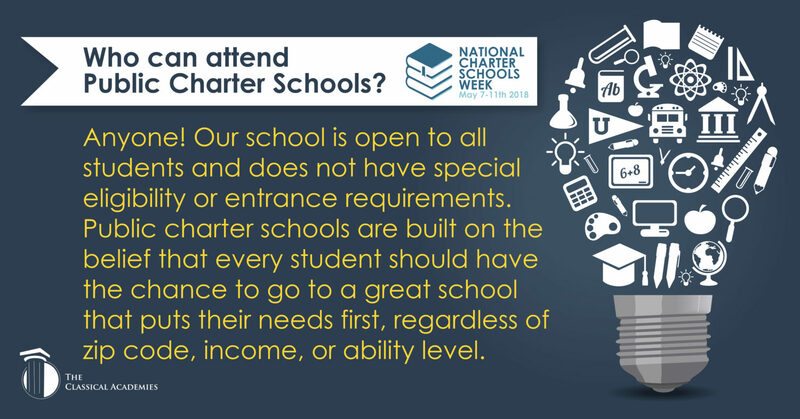 Additionally, charter schools are reviewed for renewal every five years by the school district or authorizer to ensure they have good academic results, and that they are operating in a fiscally and operationally responsible manner. Will I be required to volunteer? While parental involvement is a critical key to student success, no student would ever be punished or lose his place at a school based on a parent’s volunteer hours. Decisions about parental involvement often involve an agreement between parents, teachers, and administrators. Teachers, students, parents, and administrators all have a say in the types of instructional methods, materials, and academic programs the school offers. Charter school models include, but are not limited to: college preparation, bilingualism, performing arts, math, science, technology, and more. Charter schools have more flexibility than traditional public schools, so they are uniquely situated to provide innovative, high quality educational services. Because of this, charter schools are uniquely situated to provide innovative, high quality educational services to students with special needs. In order to support students with special needs, charter schools will often tailor their educational program or create specialized programs. Depending on a student’s individual needs, offering appropriate special education services may result in the charter school working with a district program, a non-public school or agency, or another charter school to provide a level or type of service that is not available at the individual charter school site. Ultimately, in charter schools and other public schools, the student’s parents and representatives make an Individualized Educational Plan (IEP) to make the final determination of what is best for the student. Some charter schools have collective bargaining agreements, some adopt the agreement of the local school district, while others do not – this is a decision that the school community makes as the charter school is developed. At charter schools, teachers and support staff are involved in the governing structure of the school – so they have a direct voice in the operation and management of the program. In California, charter schools are required to hire credentialed teachers for core and college preparatory subjects just like all other public schools. Can charter schools be run by private corporations? In California, some charter schools may be operated as or by nonprofit corporations, but these schools are not privately “owned.” Rather, they are more akin to private-public partnerships, where the non-profit is held publicly accountable by many different state agencies. All California charter schools, no matter how they are operated and governed, are part of the public school system– overseen by a school district, county office of education or the state Board of Education. Public charter schools are highly regulated, have oversight from a local school district, and are required to prove that they are educating students and appropriately spending taxpayer dollars in their programs. Every 5 years a charter school is required to make a presentation to a local school board, County Office of Education, or the State Board of Education to detail their results. If the school is not fulfilling planned outcomes and objectives, the governing Board can vote to close the school. This process does not apply to traditional public schools. That high level of accountability is also extended to parents whose children attend the public charter school. If students are not learning, parents can remove their children, the school by default, will close based on parents opting out of the program. Public charter schools offering an independent study format, like The Classical Academies, are annually required to report exactly how their revenue was expended and is required to meet state mandated thresholds for teacher salaries and benefits, student instruction, and the cost of managing the program. If defined thresholds are not met, the state will cut funding to the program resulting in a possible closure. This process does not apply to traditional public schools. Charter schools are required to have an annual independent financial and program audit. In the event that financial irregularities or fraud is uncovered the local school district, County Office of Education, or State Board overseeing the school can revoke the charter and close the school. In traditional districts, independent audits are performed every three years and financial irregularity or fraud does not result in the closure of schools. A local school district, County Office of Education, or State Board overseeing the school closes public charter schools that are failing students academically or found to be fiscally unsound. Traditional schools that are academically failing are by default given more money in hopes of seeing that results are changed.